Heckler & Koch Fined $4.2 Million Over Assault Rifle Sales In Mexico A court in Germany ruled that Heckler & Koch broke the law when it allowed some 4,500 G36 assault rifles to reach Mexican states where drug cartel violence had prompted a ban on such deals. German demonstrators used crime scene tape and replica guns to draw attention to a trial over Heckler & Koch's deal that sent G36 rifles to several Mexican states that were under a ban. The company was ordered to pay a large fine on Thursday. 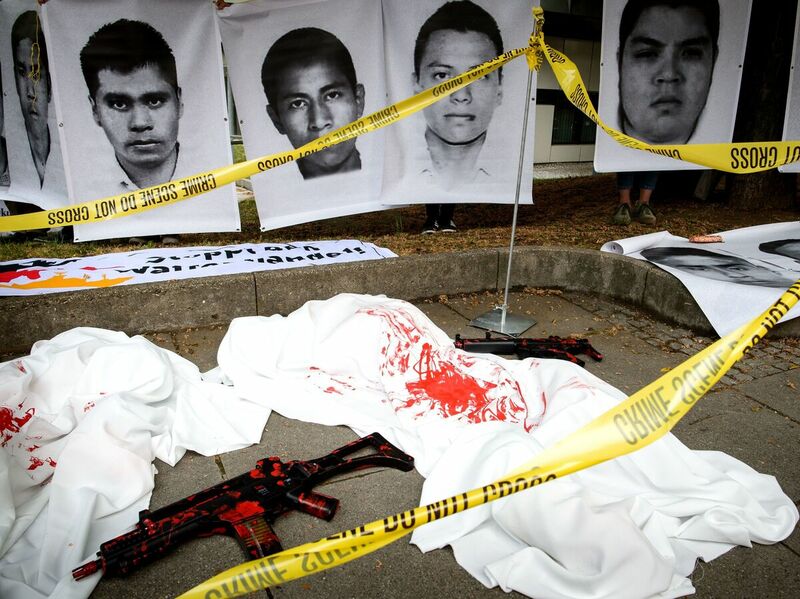 The photos above show images of Mexican students believed to have been killed with the weapons. A German court says gunmaker Heckler & Koch skirted the law when it exported thousands of military-grade assault rifles to Mexican states struggling to cope with violent drug cartels, hitting the large company with a fine of 3.7 million euros ($4.2 million). As part of the ruling, two former H&K employees were given suspended prison sentences of 17 and 22 months. Prosecutors had initially put five former employees on trial and sought prison sentences for three of them. A Stuttgart court ruled that Heckler & Koch broke Germany's War Weapons Control Act by sending more than 4,000 G36 assault rifles, ammunition and other weapons to a central government buyer in Mexico — where they were then distributed to areas seen as being at high risk for violence and human rights violations. "We will examine today's verdict carefully," H&K said after the verdict was announced. The company said it had supported the investigation and revised some of its internal rules around compliance and conduct as a result. But H&K also questioned the punishment: "We can however not understand the Court's decision that we should not only forfeit the profit generated on the Mexico business but instead forfeit the entire sales price, despite the fact that none of the directors committed an offence." The guns, which were sold in 16 batches from 2006 to 2009, are believed to have been used in at least one high-profile murder case: the 2014 kidnapping and apparent killing of 43 students from a teachers college in Iguala, Guerrero. The G36 can fire 750 rounds per minute. It weighs around 8 pounds (unloaded), according to H&K. The case against H&K stemmed from a whistleblower sharing information with Juergen Grasslin, an activist with the group Global Net — Stop The Arms Trade. The circumstances of the Mexican arms deal were revealed when Grasslin brought a lawsuit against H&K in 2010. He has also faulted the German government's oversight of weapons sales. At the time of the sales, German arms-makers were barred from exporting guns to Mexico's violence-plagued states. But Global Net reported that the powerful H&K rifles still found their way to "corrupt police officers" in Chihuahua, Chiapas, Guerrero and Jalisco. "H&K coached the Mexican procurement agency to eliminate from its end-user certifications references to certain federal states" that were under the German ban, according to the World Peace Foundation, citing witnesses in the investigation. One defendant in the case, who had headed H&K's sales unit in Mexico, died before the years-long trial reached its final stages; another man who worked as a sales rep in Mexico said he was too ill to travel to Germany. The whistleblower in the case has also alleged bribery — both in Germany and in Mexico. Some of those accusations are still being investigated; in Germany, they have also fueled criticisms that prosecutors have not gone far enough in their pursuit of the case. Grasslin echoed that sentiment after the Stuttgart court's ruling was announced, saying that while he viewed the trial as a success, it also led him to believe "the export approval authorities belonged in the dock." And he called for adding Mexican victims of gun violence as co-plaintiffs.